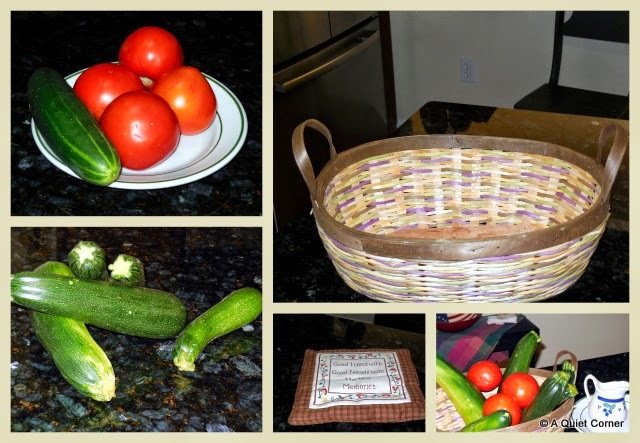 Between the tomatoes, cukes, yellow squash, italian beans and zucchini we've been getting, the freezer is now well stocked with Zucchini Bread, Chocolate Zucchini Cupcakes along with my favorite vegetable stew! As of this post I've made fifteen seventeen loaves of the Pres' favorite. While normally I use golden raisins, I improvised using chopped dates and chopped pecans for the last batch. DELICIOUS!!!! Sounds like you are all set for the first snow storm. Great mosaic JP. It's great to have all these garden goodies for the winter months ahead. Sounds like you need another freezer! ;) Good for you. I used to can and freeze and don't do much of that anymore, but love to see others carry on! When life gives you zucchini, get cooking and baking! Thanks for linking to MM JP. You have lots of energy!! The collage is lovely, fresh and crisp!! My goodness! You are busy, busy, busy baking! Glad you are enjoying your zucchini. Wow, you are well stocked.. Which one is the Pres' favorite? The tomatoes are my favorite. Great mosaic, have a happy week! you're ambitious. Could you come over and take care of the zucchini that a friend of ours keeps loading on us? Zucchini is such a prolific vegetable in the garden but it sounds like you made many wonderful things with it! Wow - you are a zucchini star!!! That's a lot of loaves! Zucchini is a wonderfully adaptive vegetable! Oh my you have been busy. Our spring was cool and I was late getting everything planted so I just picked my first zucchini.